Canopy Dimensions: 6,206mm(wide) x 6,229mm(projection). Please note: ‘Width’ is the dimension along the Ridge’ and ‘Projection’ is the dimension between the (2) outside edges of the (2) Eaves. Structural Aluminium (T6) Frame, powder-coated in Brown or White. Supporting Posts at Eaves 2,850mm. (3) Rows of supporting posts: (1) row under each Eaves, (1) row under the Ridge. Foundations for supporting posts require 750mm square x 850mm deep hole back-filled with concrete. All joints are fitted with Knee-Braces. Nominal clearance from finished ground level to Tie-bar is 1,975mm (6’6”). 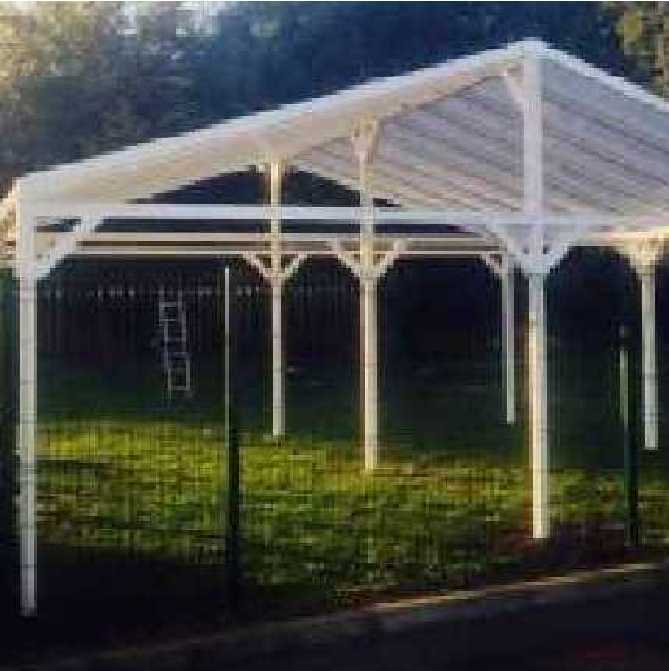 I would recommend your affordable products (Omega Smart Canopy - Free Standing with Gable Roof (type 2) | Gable 6.2m Projection | Omega Smart Free-Standing, Gable-Roof (type 2) Canopy with 16mm Polycarbonate Glazing - 6.2m (W) x 6.2m (P), (9) Supporting Posts) to anyone else considering this product, as it has been superb. Omega Build Shop | Omega Smart Canopy - Free Standing with Gable Roof (type 2) | Gable 6.2m Projection | Omega Smart Free-Standing, Gable-Roof (type 2) Canopy with 16mm Polycarbonate Glazing - 6.2m (W) x 6.2m (P), (9) Supporting Posts. You are viewing Omega Smart Canopy - Free Standing with Gable Roof (type 2) | Gable 6.2m Projection | Omega Smart Free-Standing, Gable-Roof (type 2) Canopy with 16mm Polycarbonate Glazing - 6.2m (W) x 6.2m (P), (9) Supporting Posts, buy online today!